Above is Diana, an American sport horse born in 1907, a half-TB, she can stand as an example of the enduring American tradition of breeding the finest overall sport horses in the world since our colonial days. This lovely mare was a champion field hunter and a winner in steeplechase. Seen here with her owner Mr. Stevenson, the Master of the Hounds on Long Island, NY. At the time of this photo the American Thoroughbred, Standardbred and Hunter Horse had been competing and winning internationally in England, Ireland and France in all manner of horse sport for fifty years. 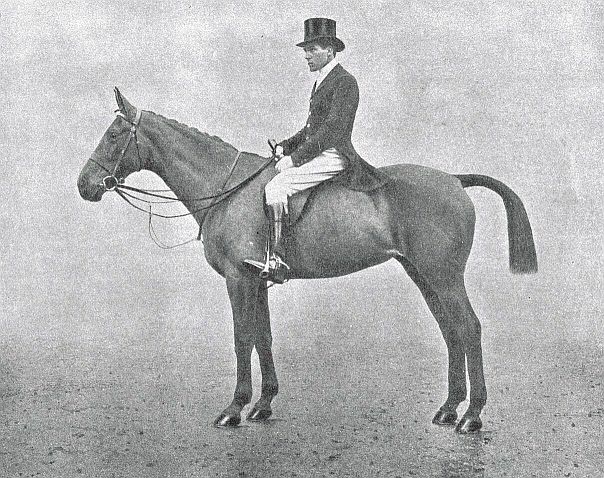 Photo from Thoroughbred Types 1926. Is there such a thing as a historical American Sport Horse? If you listen or read the industry wisdom of our day then the answer is NO! Instead you are repeatedly told that America is new to sport horse breeding. Trade rags publish that America rarely breed sport horses, one even saying that we can't really breed sport horses because we are 'uncultured' and then enlarged on that theme saying Americans are a materialistic people, and that we simply buy what we want from the countries that do actually have centuries of sport horse breeding behind them--meaning in this case the European continent ( "Breeding News for Sport Horses" 4/2003). This type thinking has never gone away and recently I ran into a version of the same narrative, this time proclaiming that Europe invented the sport horse, so I guess the deep confusion about the origins of sport remains in some minds. This revised history would amusing except it has become the accepted narrative in a large segment of our industry. These beliefs are proclaimed continuously, and unfortunately are believed not only by their originators but now by our own equestrians. The truth however is so contrary to this published dogma it is astounding that it grew feet here in the States. I must be kidding, right? No, I am not--the above list are all historical facts, and the shame is that you and I didn't know and celebrate our history, our superior sport horse or even recognize our true position in international sport. For an example of how far we have traveled down the wrong road in this and how much we need to do a 'reset' on our own history and the quality of sport genetics found in our breeds, let me tell you of a communication I had with an American industry spokesperson. This woman is highly intelligent and thoughtful, and she publishes a respected warmblood trade journal. But as well informed as she is, she confidently told me that show jumping only came about in the 20th century, from its military roots, and was only converted then to sport. She believes this so strongly that she said anyone who says differently is 'inaccurate'. Yet my own research has discovered, that even here in this new country we regularly held jumping contests in our Hunt Clubs which stretched across our country beginning in the late 1700s, whose grounds had jumping rings and provided riding rings, race tracks and cross country courses, all to test and compete our very popular Hunter Horses and keep them fit for the hunt season. Hunting on horse back and horse racing were American passions that began in the 1600s, and the horses bred for those sports were the pride of the populace. Further, by the late 1800s, we regularly had Hunter Horses competing in England, France and Ireland in jumping contests. Why don't we know this? And why don't we celebrate our heritage? This complete lack of knowledge of our own sport history is tragic. After decades of study and running down records and archives, I have now done my best to provide you with our glorious North American sport horse account; so that you too can stand proud that you are part of tradition that started at the dawn of our nation. Americans have always bred sport horses, some of the greatest the world has ever seen. We are dealing internationally with breeds that are supervised and subsidized by their government, which proclaim continually that it is they that have the centuries of sport horse breeding experience...it is a united front and a patriot practice. While in contrast our government does not and has not controlled our sport horse breeding, or sport horse development. While across the pond, in Europe and even in England, it was their royal personages or overall government that has directed the horse breeding until modern times. In many of the continent's countries it is still a state run enterprise, which makes the overall decisions on a regional or country wide basis. In contrast, 'we the people' have carried out our horse breeding as a free enterprise in America. After my more recent run (10/2018) into the confident pronouncement by a European warmblood enthusiast that no sport other than racing was performed anywhere in the 1800s, it finally dawned on me that these people who say these things are not lying intentionally so much as that they believe what they are saying is true. Interacting with this astonishing historical ignorance I realized there had to be a total vacuum in their knowledge and understanding of the Hunter culture that existed since at least 1500 in the British Isles. While Europe was breeding their native heavy draft breeds (Schwere Warmblud, Black Marsh Horse, Holland Black, Norman Draft), England, Ireland and the colonies (America etc), were immersed in their hunter culture based on their native light horse breeds where they carefully bred up horses not just for racing but for the national passion of hunting. The base stock of each area is different and resulted in different uses. My correspondents seem to think because there ancestors sometimes rode their plow horses and when necessary rode them to battle that it made those heavy horses 'sport' horses. Back in 'uncultured' America, hunting was not just a way to eradicate vermin that were decimating livestock, but since the early 1600s, it was a joyous sport, with rules and forms. Just as it was in the mother country: the British Isles for centuries more. Indeed our first President took his enjoyment in the hunt and was a noted breeder of Hunter Horses. Maybe what is self evident to us: that the Hunter Horse is the sport horse and always has been, and is what modern 'warmbloods' have morphed into, is a mental road block to the continent? It is hard to understand this blindness. In contrast on the continent what they bred for centuries was a DRAFT HORSE, a plow horse--not a sport horse. The draft horse is the performance opposite of the sport horse. It was only in the mid-1800s that they began adjusting their breeding goals--by government direction, first by importing the fabulous coach horse, hunters and Thoroughbreds of the British Isles to lighten up and refine their heavy draft horses for coach and carriage work, and to make their cavalry horse (East Prussian) more like a English Thoroughbred. Even some of our American Running Horses, Trotters and later on some of our new Thoroughbred and Standardbred entered their genes pools in this period as well, via the English imports. It is all there in the historical and pedigree record for anyone to see if they take the time and do the research. The reality is that without the Anglo breeds (and ours) that are based on a true sport horse, the European horses would not be able to perform in sport at all--they would still be pulling plows. But don't take my word for it, go ahead and extend the pedigrees of their star performers and you will discover by the time you get to the late and mid-1800s all the lines you will find recorded are Norfolk Trotter, Anglo-Norman, Thoroughbred (English, French and American), Irish Hunter, Yorkshire Coach Horse, Cleveland Bay, plus American Trotter. Many of those lines came into the continent via the Mecklenburg Stud which was assigned to improve the coach horse of the continent--and it imported vast amounts of Thoroughbred, Norfolk Trotter, Yorkshire Coach and Irish Hunters to accomplish their task. Follow those lines back--you will find the rest of the pedigrees are blank, non-recorded. Plus in their modern successful performers I have yet to discover a viable old draft horse bloodline in dominance, instead it is the Anglo coaching-hunting or racing stock, with later repeated infusions of racing Trotter and Thoroughbred, (See Donnerhall Revisted or the example of Duellant HA on the Dressage page or the update of old web page analysis of Loretto were I address the Holstein claim of 700 years of continuous selective breeding), or the true sport ancestry of the modern dressage sensations of Verdades and Valegro, or look below where I present the Dutch Warmblood foundation sire Gambo OL. There are other common inaccurate revisionist claims afloat in our industry related to this, such as the claim that the stock that became the modern warmblood sport breeds had been carefully inspected and chosen for centuries some say two-hundred years (isroldenburg.org) some say four-hundred years (Hanoverian), some say seven-hundred years (Holstein), and that they carefully bred up their stock, inspected and recorded it as well. In the course of my pedigree and historical research over the decades I never came across evidence of this inspection system in their modern breeds ancestry. Instead, I found that when their sport star pedigrees are extended, the European developed lines vanish, and the recorded background lines are all Anglo sport horse based breeds. It has become clear that the European base of the modern warmbloods were not recorded at all until the importation of the Anglo breeds. I am sure like most societies of the time they had horse fairs of some sort and maybe judged the livestock, but organized inspection with records? Can't find any evidence of that. And it is not because the continent was illiterate, they invented the printing press there in the 1400s, they were wonderful record keepers. We colonials who did not receive a printing press until 1700 and still kept better breeding records than they did. And of course we in the States had a historical record as well of performance tests, both racing and hunting. The reason a people of such high culture as the Europeans did not record their precious livestock had to be they were breeding grade style farm horses, and any selection was done in a simple manner by type of a stallion. For a perspective let's take a look at a prime example of the European 'centuries' old breed. 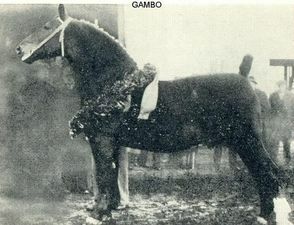 Here is Gambo OL 1927, born twenty years after the American Sport Horse Diana (1907) shown at the start of this article. Gambo OL (OL is abbreviation for Oldenburg) is found in multiples in the background of the Dutch warmblood, so here we have a product of their 'inspection' process, a European-bred typesetter. I must admit he is cute, but what is he? He looks to me like the modern day Percheron or Belgian draft horse we see in this country. He is labeled Oldenburg, but looks more draft then coach, so maybe we have a good example here. You may visit his page on Sporthorse-data site here (click on Gambo OL 1927), and check out his breeding yourself, and you will be able to extend his lines to see where the lines end up. He has some strong dominance: he is 3x4 Rubico OL 1877, 4x5 Emigrant OL1875, his dam is inbred 4x4 also to Young Othello OL 1876 and his sire to Kimme OL 4x3, so he has tight potency, which we expect in a powerful typesetter. But when you click on the names of those lines of potency and extend their pedigrees we find the same old story. Rubico OL is half Anglo-Norman and his dam is a daughter of Furst Bismark OL, whose recorded lineage is mostly Yorkshire Coach--but the majority of his lineage is unknown. We can clearly see here that while the farm horse is clearly a strength in Gambo's phenotype the European draft component is not recorded. Emigrant's recorded lines are largely Yorkshire--TB, as are those of Young Othello OL and Kimme OL...but you can see for yourself the majority of their bloodlines are unrecorded or listed as unknown. Also you will run into breed labels that are confusing such as 'Traber' which is not a name but a generic breed label--it means 'trotter', which means it was imported as well. Seeing this is 2017, and the lines bred in Europe evaporate by the late or mid-1800s with huge unknown sources combined with Anglo lineages, then we have to conclude once again, that the centuries old inspection system and the centuries old sport breed are myths. For example it was only a few years ago we were treated to an article published in a North American warmblood trade journal by the good Dr. Englehard ' from Germany' where we were taught that Germany had a 500 year old inspection system that resulted in their modern warmbloods. Okay, then where are those horses? I can't find them. And what was America producing when Gambo's European ancestors were grade plow horses of unknown antecedents? America already had 200 years of sport horse breeding then and was competing in England, Ireland and France in racing, steeplechasing, hunting and show jumping with our truly centuries old sport horse breeds and dramatically dominating those sport. England, Ireland and new America actually have hundreds of years of sport horse heritage. When you find where true sport genetics come from you will be able to use that knowledge to identify the potent carriers of today. Then maybe you can breed American and be proud to do so.